Some already-flooded parts of West Texas near the New Mexico state line are bracing for more flooding in the coming days. The town of Pecos has been among the areas hardest-hit by recent flooding on the Pecos River. The river has risen to historic levels not seen in some parts of the region since 1941, reaching a high of just over 15 feet just north of Pecos. “You could definitely call this a historical event in terms of some of the rises that we’re seeing along the river,” says Melissa Huffman, a forecaster with the National Weather Service’s Midland office. There’s a Flood Warning still in effect this evening (Tuesday, September 23) until 7 PM for parts of Reeves, Ward and Loving Counties in Texas, and Eddy County in southeastern New Mexico. 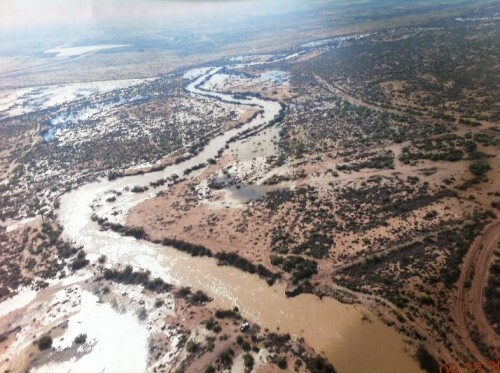 Forecasters and local authorities are keeping an eye on the river, as water sources upstream in New Mexico and on the Texas side continue to overflow and head downstream. “We’re looking at that water making it down into the Pecos area within the next two days,” Huffman says. However, Huffman says the river is expected to rise slowly over the next few days, and not from a sudden wall of water downstream, and the rains over the next few days likely won’t be as intense as they’ve been recently. But road conditions in Reeves County, particularly in the northern areas, along the river and around Pecos, could still be hazardous this evening and through Thursday as the river rises again. In Pecos, the Red Cross has so far only had to provide overnight shelter to a total of 20 people at the Pecos High School, although it has distributed more than 250 meals and snacks to people in need. “Sheltering has been relatively slow, however they are anticipating that will increase in the days to come,” says Stephanie Murphree, Executive Director of the Red Cross Permian Basin Chapter. “We could’ve been ignorant to the fact, and stayed there, and got trapped in it,” Pleasant said. Fortunately, the group drove into town, where they learned that a mandatory evacuation in certain areas was in effect. One oil worker named Randy Boland was killed when floodwaters swept his truck off a road near the Texas-New Mexico border. Local authorities, the Red Cross and forecasters are working to get the message out that despite the rains stopping, flooding is still a danger in the region. This entry was posted in KRTS News and tagged Culberson County, Eddy County, Pecos Flooding, Pecos River Flood, Permian Basin, Red Cross, Reeves County, Texas-New Mexico Border, Weather. Bookmark the permalink.